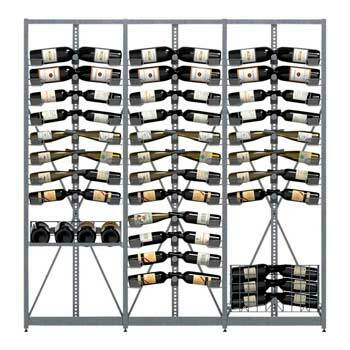 Xi Wine Systems - Wineandbarrels Ltd.
Steel racks for wine. Quality metal wine racks from Austria. Impressive shelf system for wine bottles. Fan of functionality and technical proficiency? 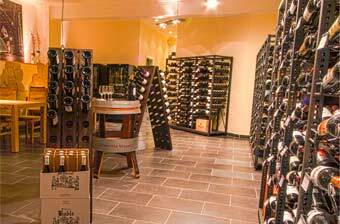 You’ll find great joy in wine racks from Xi Winesystems. On the top of the technical options, the rack comes with a rather industrial look. Xi Winesystems will make the engineer inside you come to life. 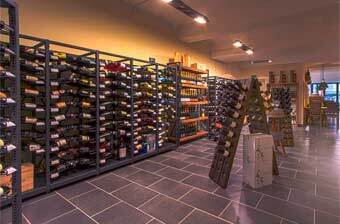 Austrian manufacturer Xi Winesystems has developed the optimal way to store and present wine bottles in all shapes and sizes. The rack is utilised perfectly while the bottles are presented in most elegant fashion. All metal wine racks are produced in galvanised stainless steel of the best quality available. Furthermore, the steel is powder coated in a neat dark grey colour tailored for all storage rooms. 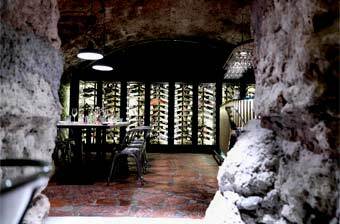 The wine racks are humidity-proof and therefore ideal for wine cellars or storage rooms with a high level of humidity. As something entirely unique, the modulised wine racks are designed for bottles of every type and shape. The standard shelves fit 99 % of all bottle types - including 6 litre bottles. For even larger bottles, you’ll need custom-made solutions, which Xi Winesystems also offer. Installing these kinds of racks requires an extra solid wall. Once installed, you can store 30 litre bottles with ease. 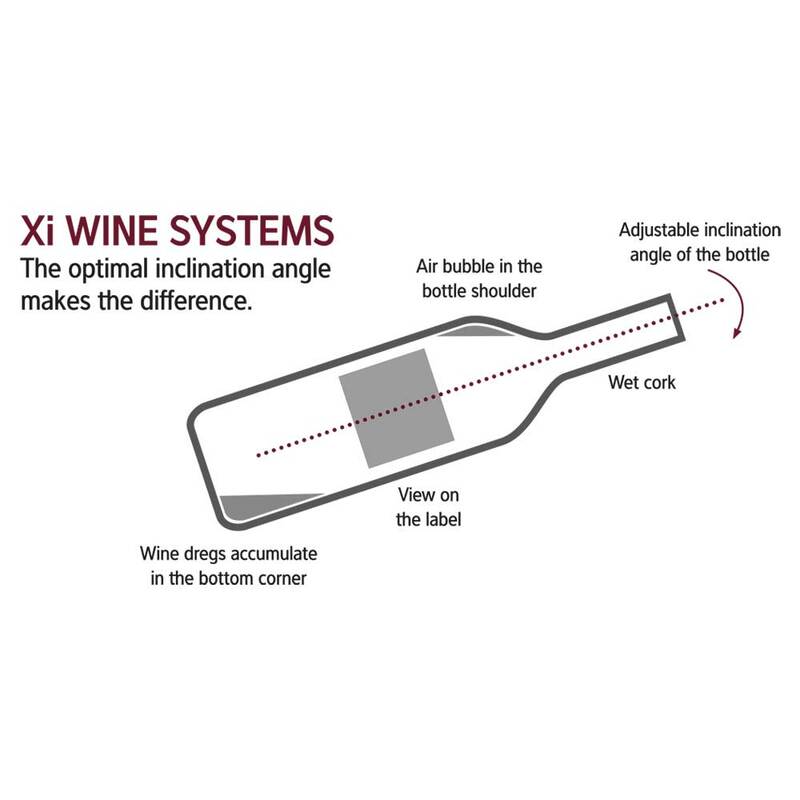 There is one paramount idea behind all wine racks from Xi Winesystems: The inclination angle. As a very unique feature, the shelves are designed in a way that allows the bottles to rest in a slightly ascending position, ensuring an inclination of 5-10 degrees. The cork stays wet at all times, the air bubble is contained at the shoulder of the bottle, and the wine sediments only drops to a small section of the bottom. Especially the sediment benefit makes it easier for you to decant a wine straight from the rack as you don’t have to place the bottle in an upright position well before drinking it in order for the sediment to establish itself. This basic concept ensures a stable wine development. You don’t have to work the sediment yourself, allowing you to serve the wine straight from storage. All your wines are always ready for decantation. The core principle of the inclination is recurrent through the entire selection of metal wine racks from Xi Winesystems. The selection contains various types and systems tailored for all needs. The system has been dubbed Xi Winesystems due to the design of the intersecting bottlenecks on the shelf. The basic module of wine racks in galvanised steel from Xi Winesystems, Xi Counter, is designed to function as a bar counter or as a table in a wine cellar, a restaurant or a shop. Every bottle in the wine rack is easily accessible. Feel free to modify the module by integrating pull-out boards, drawers or stationary shelves. In addition, you can complement your wine rack with a top sheet of either glass, oak wood or black enamelled MDF. 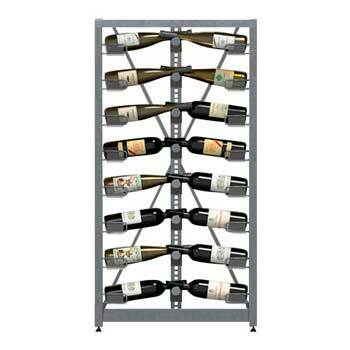 The enclosed adjustable rack legs ensure that the wine rack is perfectly level. All modules can be assembled without the use of tools. The cornerstone of the system, the Xi Counter, is extendable with the Xi Extension, enlarging the width of the counter. Extending the height of the counter is also made possible with the Xi Top. To extend both height and width, Xi Top Extension is the solution for you. 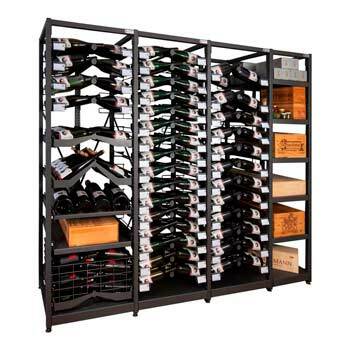 All racks include 4 shelves, offering space for 52 bottles of wine. It is possible to extend it even further, but before doing so, we recommend using the Tower-modification set in order to strengthen the centre pillar on the backside of the frame. Ultimately, this will improve the balance of the unit. Using abovementioned method, your wine rack will reach a height of 390 cm, which is the recommended maximum height. As supplement to your wine rack, add shelves, drawers and pull-out boards to your module, and create the wine rack you envisioned. The standard shelves consist of 3 units, which altogether can carry the weight of 6 bottles in the left side and 7 bottles in the right side - all of them intersecting to create the earlier mentioned X-formation. Installing a stationary shelf in the module is also a possibility. With the Xi Etagere, you’ll have plenty of space for boxes, carafes, glasses, books, trophy bottles and whatever you desire. A neat feature absolutely worth noticing are the shelf rails. The rails, which are installed in each side of the frame of the module, fit all kind of drawers, sheets and shelves of the wine rack. Without issues, you can easily exchange a sheet for boxes with a 48-bottle basket. The rails go like oiled wheels and come with a soft-close function, ensuring higher quality and better longevity. In the same formation as the standard shelves, we offer a pull-out board for bottles called the Xi Cuvee Drawer. You’ll have unhindered and direct access to every single bottle. An almost identical pull-out board, except with a little more inclination, is the Xi Gusto Drawer suited for already opened bottles. 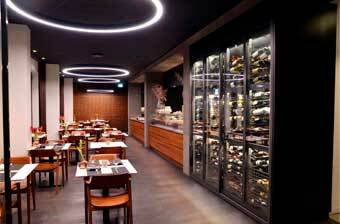 The Xi Gusto Drawer is the preferred choice of restaurants and hotels. With the DoubleM drawer, you’ll have space for the big, big bottles. On this pull-out board, there’s space for 4 double magnum bottles (3 litres each) or 3 imperials (6 litres each). The pull-out board is suited for other magnum bottle variants than the Bordeaux version, such as Alsace/German bottles, Champagne etc. Looking for a pull-out board for entire boxes? It’s called Xi Select. The Xi Stock Drawer is a basket-like drawer with space for 48 bottles. A big pull-out board with more than great capacity. Every purchase is enclosed with a set of rails. Xi Grand are wine racks for the big, bigger and biggest bottles. The system, which requires wall mounting, are spacious enough for bottles from 3 (double magnum) to 30 litres (Melchizedek) to fit. The latter is not exactly the usual bottle type, but we don’t want to exclude anything. 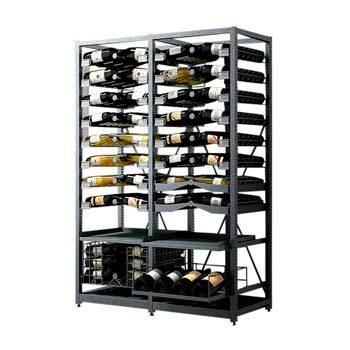 Xi Winesystems wine racks come in black metal and with space for enormous bottles. The wine racks are created on the same principle as the rest of the system: Having the right inclination angle. 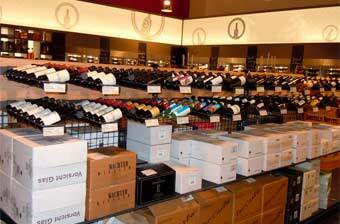 Wine racks for large bottles are popular among restaurants and wine stores, as they want to show off the unusually large bottles to visiting customers. As a very unique feature, the system offers mechanical support in order to manage the big bottles when serving. The customised decantation machines come in 3 sizes. A decantation machine helps pouring the content of the big bottles into smaller devices such as carafes and glasses without fumbling due to the weight. Besides, it’s quite an amusing and spectacular sight to watch. 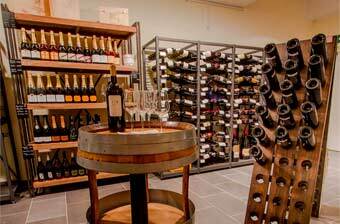 Looking for quality wine racks to your shop or business? Let Xi Winesystems help you. Xi Shop is the name of the shelves suited for most standard shop fittings - Tego for example.